Mochi ice cream has been around for decades, but Mochi is a cultural dish from Japan that has been around for centuries. If you want to learn more about the history of mochi, keep reading! From is preparation to common mochi inspired dishes, we’ll cover it all! Mochi, formally mochigome, is a type of short-grain rice. The rice is pounded into a paste, which is then molded into any shape you desire. Mochi is made throughout Japan in a ceremony called mochitsuki. In this ceremony, people gather to pound the rice into mochi. This results in an abundance of mochi that can be eaten year round. It is known as a traditional food for the Japanese New Year. Before the rice is pounded, it is soaked overnight and cooked thoroughly. The pounding process requires two people—one pounder and one rotater. The pounder’s job is simple. Using a wooden mallet, they pound a mortar filled with mochi. As the pounder pulls the mallet upwards, the rotator with turn the mochi to ensure it is kept wet. This process requires fluid rhythm to avoid injury. Today, there are machines that expedite this process and take out the immense labor that is involved in the traditional methods. Since the first formation of mochi, this sticky dough has been adapted and included in many dishes. In Japan, there are hundreds of variations of mochi candy. Some of the most common forms of mochi candy are wagashi and mochigashi, which are traditional sweets and daifuku, a soft round mochi stuffed with a sweet filling. These treats are wildly popular in Japan and are recreated with delicious fillings. Mochi ice cream, our bread and butter, is simply small balls of ice cream wrapped in a thin layer of mochi. This sweet treat has become more and more popular throughout the past few years in the US. It is readily available in almost every major grocery chain across the nation. 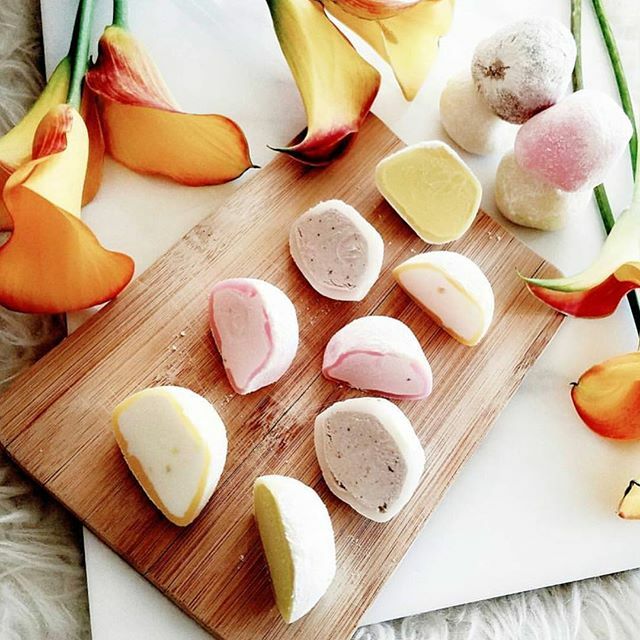 Mochi ice cream comes in a wide variety of flavors, including chocolate, vanilla, green tea, and more. These ice cream treats can be eaten on the go or adapted to become its own dish. In Japan, there is a soup called, oshiruko or ozenzai, which is a bean soup that is commonly served with pieces of mochi. The soup is commonly made with azuki beans, a small sweet bean that is common in many Japanese dishes. Another soup, chikara udon, is a noodle soup that is topped with a layer of toasted mochi. A thin layer of mochi is placed on top of the soup and is toasted to enhance the flavor of the soup and keep the heat within the broth. Some other mochi creations are Dango, a dumpling made from mochi, warabimochi, a jelly-like confection that is a popular summer treat, and Moffles, which is a waffle made from mochi that is topped with many other sweets, such as ice cream and chocolate.